Yemen has a unique architectural heritage, one from which we can learn and draw inspiration. The practitioners, the master builders and craftsmen have learnt how to build to suit geography, location, the climate and available materials. They have by necessity had to “work with” the local conditions and in so doing have developed over generations knowledge and craft specific to the locality and people. This is exemplified in the Wadi Hadhramaut, an area of Eastern Yemen at the edge of the desert or “Empty Quarter”,where it becomes a plateau cut with deep valleys or “wadis”. As the source of water and therefore food, all settlements occurred along these wadis, both buildings, agriculture and the way of life adapted to the extreme conditions, hot and dry with one short sharp rainy season. The centrepiece and best known town in the area is Shibam, a UNESCO World Heritage site, known in touristic terms as “The Manhattan of the Desert”,a walled town of approximately 500 houses which rise up to ten storeys from the wadi floor. These traditional “tower houses” accommodate livestock and storage on the ground floor and living quarters above. Often there is a social space, the “majlis” with a terrace on the top floor. In Shibam there are also mosques, schools and administration buildings. Shibam is built solely of mud bricks made by hand and baked dry in the sun. Buildings made from earth tend to be associated with mud huts and to be seen as primitive and unsophisticated; the architecture of the Hadhramaut shows you otherwise revealing the versatility of mud brick and you get the impression that almost anything can be done with it. Further up the wadi is Sayyun the main town and capitol of the area,a busy “working”town of mud brick buildings and further on is Tarim a city known architecturally speaking for its vast palaces. They display intricate and ornate decoration which attempts to recreate in mud the classical motifs of European colonial architecture in India and Indonesia, where the building’s owners will have made their fortune. The Yemenis are known for working abroad to support the family back home hence the array of influences brought home to celebrate their success. The string of small towns along the Wadi Daw’an [a tributary of the main valley] are made up of houses that look as if they have grown over generations. They are often in spectacular locations and as an ensemble look as if they have grown out of the landscape. The tradition of construction using mud bricks continues today in the area; a visitor can see old buildings being repaired and extended, new buildings in the existing towns and even new settlements. When a building is to be replaced and renewed it is demolished and the earth is re-used. 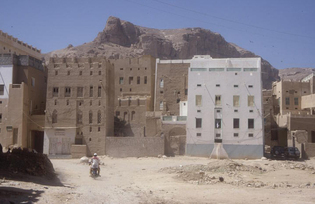 In common with the rest of Yemen there was a period of building with concrete frame and concrete blocks-introduced 40 to 50 years ago-thought to be quicker and cheaper to build but also seen as the “ modern way” and “as its done in the West”. But this way of building is “thin”- heat passes thro’ easily-it needs energy hungry air conditioning to keep it cool. By contrast the mud brick buildings keep themselves cool; it happens “passively”, it is an inbuilt part of the design. The mud brick buildings have thick walls often a metre and a half at the bottom tapering to half a metre at the top. The mass of the walls is ideal for keeping the inside of the building cool; window openings are kept small and located to avoid direct sunlight and have ornate wooden lattice which provide shade as well as privacy. Taller buildings also have a shaft adjacent to the main staircase which acts as a chimney for “pulling” a breeze thro’ the building, cooler air at ground level being drawn up thro the building. The layout of the buildings -close together, means they provide shade for one another and also shade the ravine like streets in between. After a long and still continuing experiment with “western” construction the Hadhramis have recognised the inherent qualities of their mud brick buildings, and although the latter are more labour intensive and slower, [in the past a tower house may take five to eight years to build] there is also an inclination to return to the traditional way. 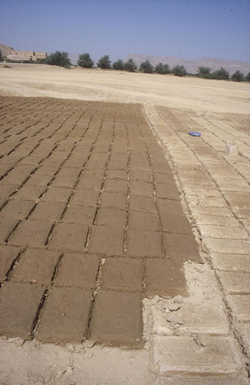 The earth for the mud bricks comes from the wadi floor ready saturated after the rainy season; concrete construction uses imported cement which takes energy in both the processing and the distribution. The mud is mixed with chopped straw and water and then spread into simple wooden moulds on the ground to bake hard. The bricks are more like flat cakes approximately 45 centimetres long by 30 cm wide, narrower bricks are made for the upper storeys . They are 75 to 100 cm thick. To make a wall they are laid interlocking with a mud mortar and then rendered with a finer mud layer to make the wall smooth. But what stops it being washed away?– It’s a common question. The answer is-the type of earth, which is just the right combination clay and silt and sand – it just sets very hard and although a thin outer layer may get washed off during the rainy season it is basically waterproof. Even the flat roof? The roof and parapet walls at the top of the buildings are the most vulnerable area- an earth building needs “a good hat and boots”-the boots are a stone built plinth, often the first two metres of the building above the ground, which stops moisture in the ground rising up and provides protection from abrasion by people and animals. The hat- the roof- is also covered in mud, with vulnerable parts such as parapets coated with a high quality lime render called “nurah”. A visitor will notice many lime kilns as well as fields of mud bricks drying in the sun. Sometimes nurah is applied to the whole roof surface; it is built up in layers, increasingly more refined and then painstakingly “polished” using a specially shaped stone. The nurah is also used decoratively: around windows and doors and it is also nurah from which the intense decoration of the Tarim palaces is made. 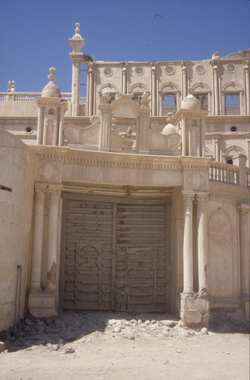 Due to its World Heritage status Shibam in particular has received a lot of attention. In an effort to preserve the city the city wall and the adjacent road and terrace to the wadi have been substantially rebuilt and a piped water system and sewage system has been introduced. It is said that the increase in waste water directed into the ground has upset the buildings’ foundations and is indicative of how carefully balanced the centuries-old set up has been. 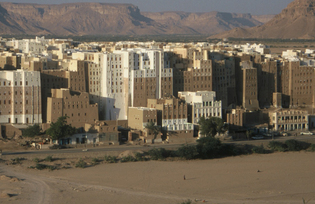 Shibam was a trading town on the Frankincense trail from East to West and would have been a busy place….but essentially the town had to be self sufficient -in what is a remote location. In the past there would literally have been no waste-even human waste was collected and dried and used for fertilizer or fuel. All resources would have to be carefully and efficiently used. Water in particular – evident throughout the area are a system of terraces and walls around fields and channels which harness water from the wadi in spate during the rainy season. Crops have been adapted to grow in soil drenched just once. This traditional system has largely been superseded by mechanical well technology which has enabled the irrigation of crops, although again this has caused a lowering of the water table to levels that in some areas are considered critical. So what can we learn; that there is an alternative to one size fits all modern construction-a traditional material can be adapted to new uses and can incorporate modern systems but with care; there is an alternative to the “out with the old and in with the new” approach- one which offers continuity so people can not only see and feel a link with the past but with the continuation of the skills and craft it can be part of daily life. Finally we can be inspired by building in earth-a misunderstood material…..for even in Yemen there is a saying “better a house of stone than a palace of mud”. From an ecological perspective it is the most versatile of materials….it is on the site to begin with, it uses the suns energy in its processing and if and when the building is redundant it does literally return to the earth without leaving any “footprint” at all. Mud brick offers a more gentle and satisfying way to build and develop in the modern world than people perhaps realise.